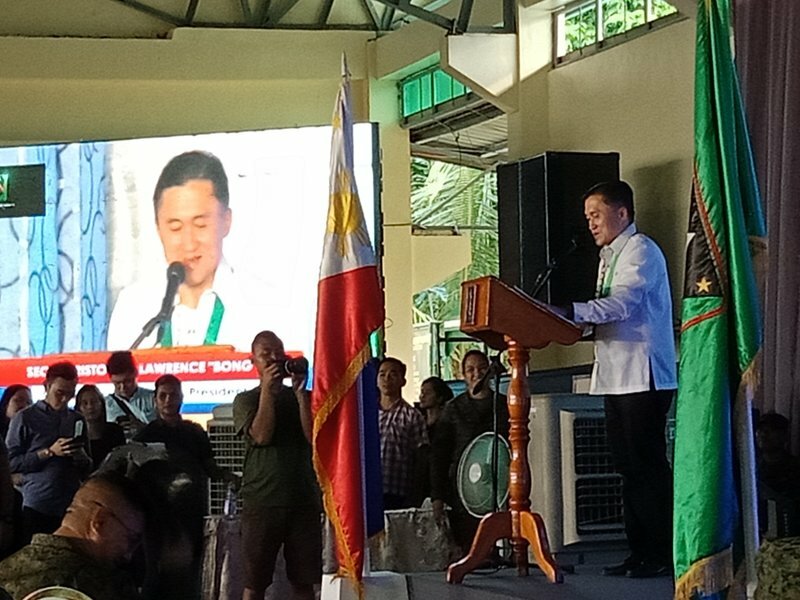 PILI, Camarines Sur (Bicol Standard) – Special Assistant to the President, Secretary Christopher Lawrence “Bong” T. Go expressed his gratitude to the 9th Infantry Spear Division (9ID) of the Philippine Army for their invaluable efforts in supporting peace and development in the Bicol region. Go, who was the guest of honor during the celebration of the 14th Founding Anniversary of the 9ID at Camp Elias Angeles, San Jose, this town Monday afternoon, said the strong cooperation and collaboration among the Army, local political leaders, law enforcers, private sector partners, and other stakeholders, is the formula to achieving peace and development. Meanwhile, in the same occasion, Go stressed that the government is reiterating its commitment to improving the transportation of goods and services in Camarines Sur and the rest of the region through the administration’s Build Build Build Program. “In August 2018, the Department of Finance has included in its shortlist the proposed Camarines Sur-Catanduanes Friendship Road as one of its twelve big projects which will be funded by the Asian Infrastructure and Investment Bank (AIIB),” he revealed. “The Department of Public Works and Highways (DPWH) is now conducting its studies on the Php 2.25-billion Camarines Sur Expressway project,” the Secretary added. Also among the government’s projects is the Php300-billion PNR South Long Haul Project which will shorten the travel time from Manila to Sorsogon and vice versa, Go bared. He added that also in the pipeline is the Pasacao-Balatan Coastal Tourism Highway in Camarines Sur worth P4.74-billion, which will be funded by the AIIB. Meantime, for Albay, “the Department of Budget and Management (DBM) has approved the construction of waterworks systems and upgrading of exisiting water system facilities in several towns to provide adequate and safe water supply in the entire province,” he announced. Further, Go emphasized the three-point campaign of President Rodrigo Duterte against drugs, corruption, and criminality, for which he sought the continued support of Bicolanos. Apart from the members of the 9ID, in attendance were BGen Arnulfo C. Matanguihan , Assistant Division Commander of the Armed Forces of the Philippines (AFP) and MGen Jesus A. Manangquil, Jr., AFP Commander, leaders of local government units across Bicol, representatives of the Philippine National Police Regional Office 5, and several local entrepreneurs.